I’m really pleased to see The Haunter of the Dark has received a solid review at RPG Geek, with Eric Dodd running through the essentials in concise fashion (and highlighting a spelling error I’ll have to correct on the next pass). I really enjoyed writing this 88-page guide to mining Lovecraft’s stories to create new adventures. Putting together Thro’ Centuries Fixed (released in November 2016) allowed me to do something similar with another story – and I’m finding deconstructing the fiction as enjoyable as re-reading it. Lovecraft can be a rewarding reading – not without issue on many levels – but, he fills the page with a rich tapestry well worth unpicking! Eric includes an image of the highlighting used in the PDF version. In the second half of the book, I do a bit of an autopsy on The Haunter of the Dark – and highlight key sections with colour and an icon. For the printed version of the book – with a black and white interior – I have opted for a different typeface distinctive enough to pick out the key text, so the icon carries more weight. Very interesting and worthwhile read for anyone who wants to take Lovecraftesque stories and turn them into adventures for any system. Good reading of The Haunter of the dark exploring its themes in a number of directions. Well worth reading and stealing for story ideas and reviewing methods for any analysis of stories. Along with other general books like Stealing Cthulhu, The Haunter of the Dark is recommended to anyone trying to write an adventure in a true Lovecraftian style. 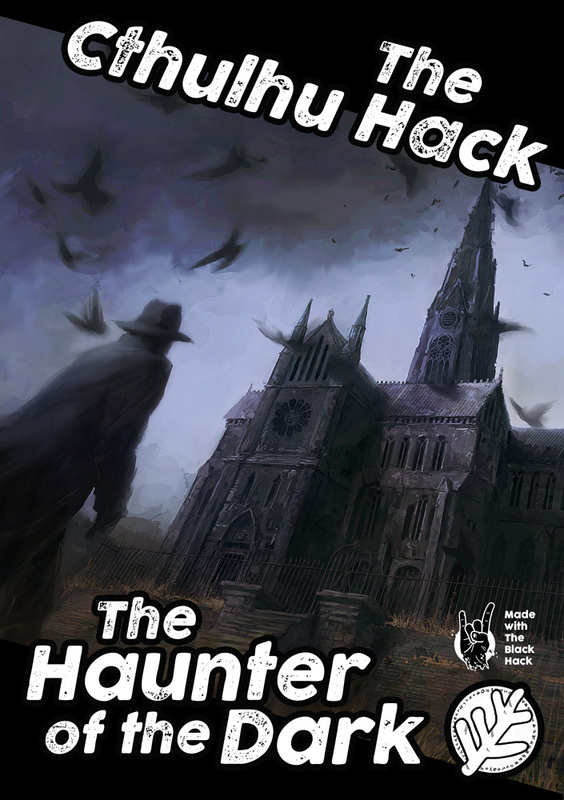 Until the end of the Halloween event, you can pick The Haunter of the Dark up in PDF as part of The Cthulhu Hack Halloween bundle for less than $8, which covers everything released to date.